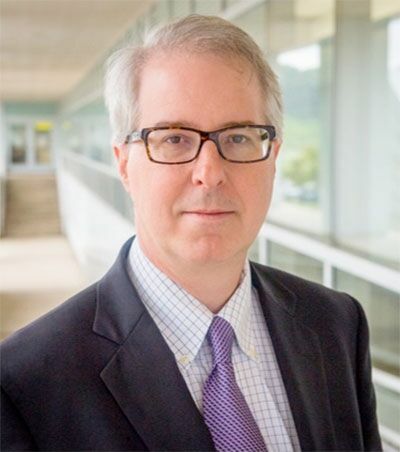 Stuart Henderson (PhD 1991, Physics) has been appointed director of the U.S. Department of Energy’s Thomas Jefferson National Accelerator Facility in Newport News, Virginia. He assumed his new responsibilities on April 3. At JLab, Henderson manages all scientific initiatives and activities, including strategic and long-range planning processes. He also works to build a comprehensive program to promote the interests of the lab and its users. Specializing in nuclear physics, JLab has a staff of 700 and an annual budget of $150 million. It occupies 169 acres and has 83 buildings and trailers. Physicists there probe the structure of protons, neutrons, and small nuclei. The lab is currently completing a $338 million upgrade to the accelerator that doubled its energy to 12 giga-electron volts (GeV). Henderson previously served as director of the Accelerator Institute at Argonne National Laboratory beginning in 2014. He led development of a proposed rebuilding of the x-ray synchrotron, known as the Advanced Photon Source. From 2010 to 2014 he worked at Fermi National Accelerator Laboratory (Fermilab) and before that, at Oak Ridge National Laboratory, where he led commissioning of the lab's $1.4 billion Spallation Neutron Source. Prior to joining Oak Ridge Henderson worked at Cornell University on its Cornell Electron Storage Ring. Looking back on his years as a graduate student at Yale, Henderson recalls his time spent at the Wright Nuclear Structure Laboratory and Brookhaven National Laboratory, where he carried out his Ph.D. thesis research. Henderson is married to Yale Graduate School alumna Jacqueline Soltys (PhD 1994, Slavic Languages and Literatures). They met on the day they first moved into HGS and were married in 1992, about seven years later. They have two daughters, Sophia and Grace.